- "Nobody told me what they expected...until my appraisal." - "Nobody gave me feedback to let me know how I was doing, so that I could improve." ...problems solved by ActionLog's continuous coaching! ...problems solved by ActionLog's performance plans and Coaching Journal! · Truly effective performance management, using continuous coaching and 360 degree assessment, is often difficult and expensive to implement, but ActionLog makes it easy and inexpensive. 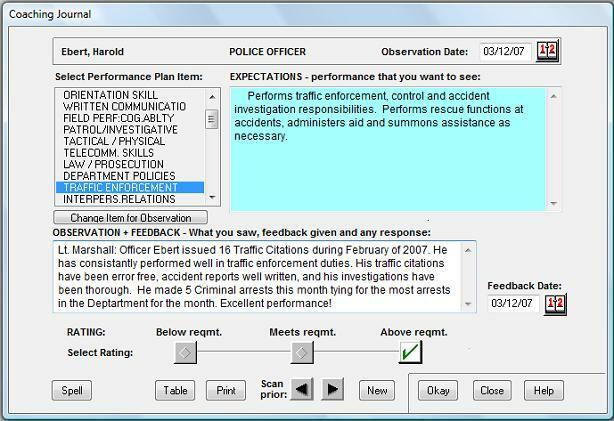 · Performance management software often puts the user in a straightjacket, allowing only narrow capabilities for creating your own performance plans and rating scales, and little or no job-specific sample text to use and adapt to your own needs. But, ActionLog allows great flexibility and provides a job-specific library of sample performance plan text for over 350 common jobs. · Security and confidentiality issues are often dealt with inadequately, but ActionLog provides a robust multi-level password security system, and all coaching and rating data is encrypted for confidentiality. · Multiple rating scales available - 3 point, 5 point, etc. Rating nomenclature is customizable..
· Weighted scoring available for each part of a person's job, to reflect the varying importance of the topics being rated. 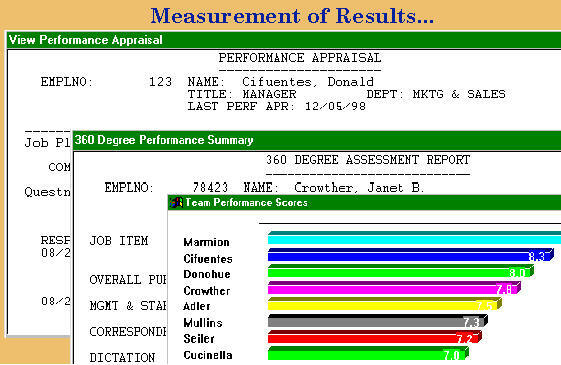 Performance plans can be printed on demand or accessed on line. Designed for use by all types of organizations, of all sizes. For example, the Mt. Lebanon, PA Police Department has successfully used ActionLog to help its 44 officers and 52 school guards achieve their best potential. If you are not completely satisfied with the ActionLog single user version, just phone us for a return authorization code, uninstall it from your computer and return the product to us within 30 days of your purchase. Then we will refund your purchase price.